In just one year, Giro has seen an 83% increase in site traffic, and organic search revenue has increased by over 158%. 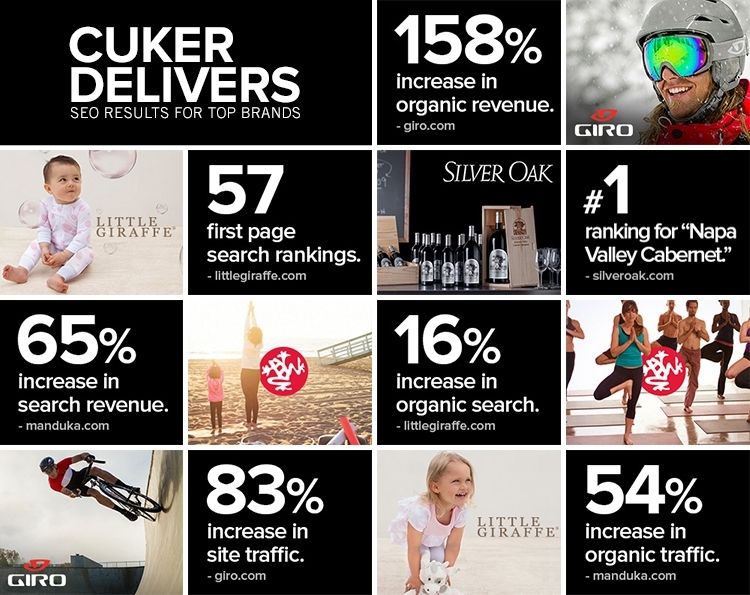 Since implementing a comprehensive SEO setup plan in 2012, Giro has dominated search engines and outranked big box retailers for highly competitive terms including “bike helmets,” “road bike helmets,” and “snowboarding helmets.” Overall, Cuker has grown Giro’s search revenue by over 110%, with a 70% higher conversion rate and a 130% lift in unique purchases. Since the launch of their new content-rich, SEO-friendly website in August of 2010, Manduka.com has experienced a 54% increase in traffic, and a 64.9% increase in non-branded organic search revenue. Cuker’s SEO efforts have secured 26 first page Google organic search rankings for priority keywords, more than half of which are in the coveted top five positions. Just two months after launching their new upgraded CMS and eCommerce website, non-branded organic search traffic is up 16% over last year. The revamped Little Giraffe site has also resulted in an improved eCommerce conversion rate. Recharged SEO efforts have secured 57 first page Google organic search rankings for important keywords, 40 of which are in the first five positions. Published on July 31, 2013 .